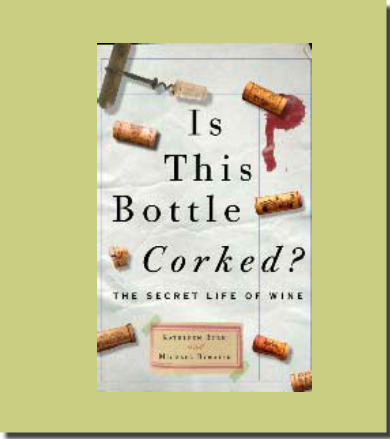 Book Review: Is This Bottle Corked? This is just the kind of off beat book about wine that you might find very interesting. No chapters about what to drink, how to drink, how to match food with wine, and other tiresome wine preaching. Rather, this book offers 138 somewhat obtuse but fascinating questions about wine. The authors, Kathleen Burk and Michael Bywater, are not wine gurus or critics, but rather wine lovers who have an interest in the historical perspective of wine. The result is a book with an academic tone, offering short and straightforward answers that fascinate rather than bore the reader. Examples of questions posed include, “What did Jane Austen recommend for headache?” (Answer: Constantia wine), “Did Benjamin Franklin really produce a ‘sprightly claret?” (Answer: He gave instructions on how to make wine in the Colonies in the 1743 edition of Poor Richard’s Almanac), “What was Napoleon’s favorite wine?” (Answer: Clos Vougeot and Chambertain), and “Was Pliny the first Robert Parker?” (Answer: No 100- point scale, but he was unrivaled as a wine scholar of his time). There are a number of other questions answered which will enrich anyone with an interest in wine such as, “Who first invented wine,” What is terroir, and should we care,” and “Should wine be decanted.” Because the short chapters are devoted to one question, the reader can pick up the book for short periods of time and thumb to a question of interest without reading the book from front to back. Wine writers will find the book a special resource of historical facts. Published by Random House, Inc., 208 pages, hardcover, 2009, $19.99.